Reliable data backed by over 30 years of experience. 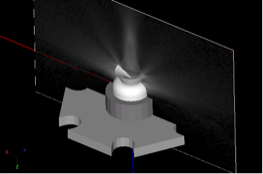 An important issue to consider when using any optical design tool is accuracy. As a designer, you need to trust that your design tool is accurately predicting the distribution of light within your model. Time and money is lost when software tools fail to produce accurate results. We at LTI Optics understand this issue first-hand. We use Photopia on a daily basis to design products for our clients. The most crucial piece of the raytracing process is an accurate light source model and accurate material reaction properties. Without these, even the easiest to use, fastest raytracing engine still lives true to the Garbage In, Garbage Out mantra. At LTI Optics, we've had over 30 years of experience in modeling and measuring light sources and materials for use in raytracing software. Each of the over 1900 items in the Photopia Library have been created and verified by our engineers, with a level of precision and care that is unmatched in other source and material libraries. 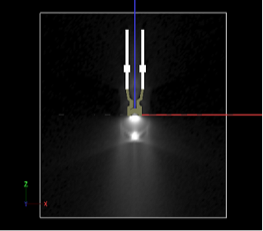 Producing accurate simulations of optical systems requires accurate source models. There are several ways that sources can be modeled and these various methods are discussed in some detail in this SPIE Lamp Modeling Paper. Some modeling methods have trade-offs in accuracy and can therefore only be used in designs where the decreased accuracy is acceptable. For most secondary LED optics however, there is little tolerance for compromises in source model accuracy. This is why Photopia's LED source library uses the most accurate type of model possible. These are referred to as Type 3 source models, using the terminology in the paper referenced above. Type 3 source models are essentially the same as luminaire models that contain lamp, reflective, transmissive and/or refractive surfaces. The proper distribution of light is created only after all of these components interact with each other. Type 3 models are required when the interaction of the components is crucial to replicating the physical lamp's behavior in your optical system and in cases where the Type 1 and 2 models lack the required accuracy in some aspect of the behavior. To the left is a CREE XHP LED modeled as a Type 3 lamp in Photopia. 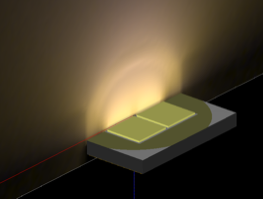 How the light is initially emitted from the LED die. The shape of the optical components (reflectors and lenses). 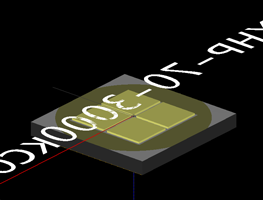 The relative position of the die with respect to the rest of the components. The materials of the various components. In order to produce both the proper angular distribution of light leaving the LED as well as the proper spatial distribution of emanation points, it is necessary to model the bulb as a refractor. This means having light start on the LED chip and then interact with both the reflector and refractor surfaces. Since Type 2 lamp models in Photopia do not support refraction and reflection of light upon initial emanation, a Type 3 LED model is needed. The reason why Type 2 models don't support refraction and reflection of light within the source model is because the effects of any refraction and reflection are already taken into account in the measured distribution assigned to the model. The main purpose of taking these interactions into account in a Type 3 model is to generate more accurate ray emanation points. See the image to the left for an example of how the internal structure was modeled for the XHP. The Refractor Module in Photopia is capable of handling the various requirements of LED lamp models. This includes having light start within the bulb material and having reflective surfaces within the bulb. The image to the left illustrates how the proper angular and spatial distribution of the rays is achieved. Rays emanate from the LED chip and some reflect off of the reflective surfaces while most go toward the bulb/air interface directly. Some light then exits the bulb and is refracted appropriately and some light reflects back into the bulb due to Fresnel's reflections. Depending on the relative size of the chip and shape of the bulb, some light will also get redirected back into the LED via TIR. The image to the left shows the light emitted from the chips on a shaded plot with the bulb layer turned off. The bulb was on during the raytrace and turned off only for this image. You can see how the light initially emits only from the luminous chip. You'll also see how the color over angle and color over source area are fully characterized. We gave a CORM presentation on color lamp modeling. 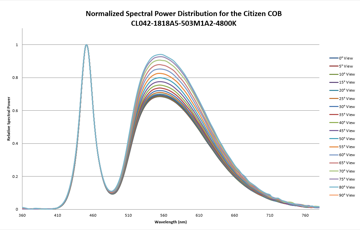 We also take care to measure the varying color emission with respect to emission area and emission angle. To the left is a COB LED which shows how the color over emission area and angle change. To the right is a plot of the measured SPD over emission angle, data we measure ourselves while constructing a lamp model. Raysets have become a convenient way to model light source behavior, and are commonly provided by LED vendors. A rayset is simply a collection of rays (vectors) that describe the initial emanation of light from a source. 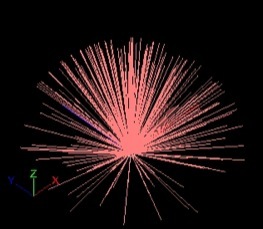 Each ray consists of a start point, direction, and magnitude (in lumens). Rayset files are ususally provided in multiple formats for compatability with most optical simulation software. Raysets are missing one key component of a lamp model, geometry. Raysets only describe the exiting light and do not contain any geometric data about the light source. Since there is no geometric information, there is nothing for the light to interact with if it comes back towards the light source. Some vendors provide 3D cad models as a supplement to their raysets, but this relies on the users to assign appropriate materials to each part of the LED. 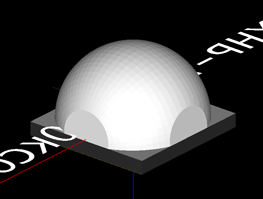 Additionally, many of these CAD models don't contain enough detail but only describe the bounding volume of the package. This lack of geometry also causes an issue with accurate ray emanation points. Since there is no geometry, the ray emanation points are not coming from geometric locations, but just points in space. The process of combining the 2D images to create raysets does not seem to provide an accurate way to determine correct ray emanation points. The images to the right show a side view of the Lumileds Rebel LED. The image on the left shows the light field for a ray set downloaded from Philips website for this LED. The geometry is included only as a reference since the rayset based model doesn't contain any geometric information. The image on the right shows a Photopia lamp model, with the associated geometry. The light field for the Photopia model matches the geometry precisely. 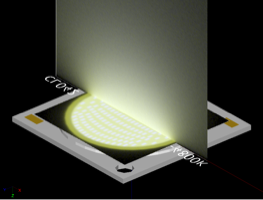 The light field from the rayset shows many rays emanated from behind the chip inside the LED base and some rays from behind the LED package. Those rays would be blocked if a PCB were included in the simulation. The plots below show the consequence of incorrect ray emanation points when using secondary optics. Raysets seem to have a good potential of capturing near field photometric data, however, they do have some significant limitations. Their lack of CAD geometry puts the responsibility on the user of the software to import and assign materials in order to achieve an accurate result. Additionally, because the data is sometimes compiled from a series of 2D images, raysets often don't contain accurate 3D emanation points. Of the two aspects of lamp modeling, where is the light going and where is it coming from, raysets only accurately address where the light is going. Without proper material assignments to the 3D geometry as well as the proper emanation points, photometric simulations can be very inaccurate. These case studies use data collected by BetaLEDTM during the development of their NanoOpticTM LED outdoor area lighting lens optics. The data includes measured luminous intensity distributions along with simulations using both Type 1 and Type 3 source models in Photopia. The optics were measured at Independent Testing Laboratories, Inc. (ITL) in Boulder, Colorado, USA. The simulations used lens geometry that was scanned from the physical as-built parts. This is important since the as-built parts did not always perfectly match the intended design, which removes a potential source of difference between measured and simulated performance. The Photopia models on the right do a better job of predicting the beam shape than the rayset based models on the right. The rayset based models over predict the amount of light at nadir, which is a critical component of a roadway lens like this one. The rayset model also incorrectly predicts the correct peak beam angle location, which is also important for roadway optics. The images on the right with a Photopia lamp model show a more accurate overall beam shape and peak beam angles. This case illustrates how the differences between the 2 model types remains significant when a gel is used between the LED and lens even in a much narrower beam distribution. 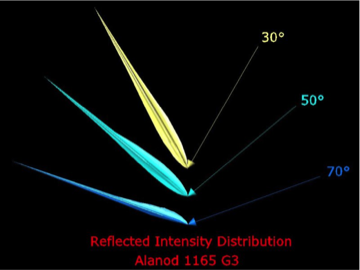 The higher intensities seen in the central part of the beam using the rayset model on the left result from the extra lumens that were not directed to the higher angles in the distribution where they belonged. The Photopia model results shown on the right reveal a much closer beam shape at the full range of angles in this distribution. The 2 cases presented illustrate that there are significant differences in simulated results depending on the source modeling method used. 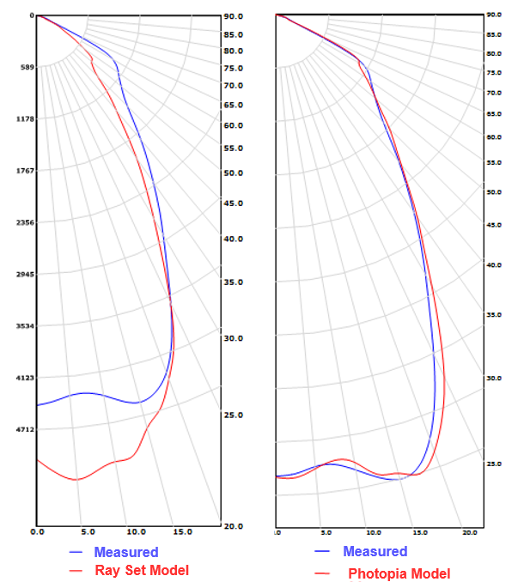 These results show that a Photopia model more closely matches the measured performance than the rayset model for both wide and medium beam lenses. The differences are greatest when an index matching gel is used between the LED and lens. The main reasons for this are that in addition to the challenge rayset models have in creating accurate 3D ray emanation points, all of their digital images showing the luminous view of the source are measured in air. When a gel is used between the LED and the lens, light never exits from the LED primary lens into air so the measurements are inappropriate. Since Photopia models include the lens geometry, the material can simply be changed to account for the glass / gel interface instead of glass / air. The 1st set of data shows that the rayset model fairs better when there is no gel, yet it does not outperform the Photopia model. Wider beam optics are more sensitive than narrower beam optics to exactly how much light is directed onto each part of the lens. As the beam gets narrower, more light is directed to the same angles in the beam and differences in the amount of light sent to each part of the lens between the simulation and physical reality become less important. It should also be noted that other 3D ray emanation point geometry mapping options were tested such as mapping the points to a sphere and the results did not vary significantly from those presented here. 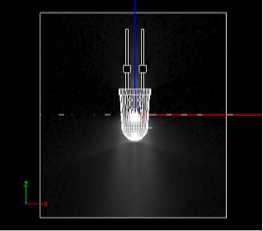 Given a choice between rayset and Photopia source models for the same LED, a Photopia model will likely produce more accurate results, especially as the beam gets wider. If gels are used between the LED and lens, then rayset models should not be used since the measurements on which they are based is not appropriate for this situation. The simulation data in these case studies was provided by Kurt Wilcox and Chris Strom at Ruud Lighting. ITL in Boulder, Colorado provided the physical measured data for comparison. LTI Optics currently uses our 2nd generation custom-built BRDF/BTDF measurement device to accurately characterize the real reflecting/transmitting properties of various materials such as semi-specular aluminum, hammertone, prismatic lenses, perforated diffusers, and many others. The measurements are collected for a wide range of light incidence angles to capture the true scattering nature of real materials (see images below). Photopia uses the measured data in lookup table format and therefore does not attempt to “curve fit” the data into standardized equations that do not model the wide range of scattering effects observed in real materials. The library of measured data also eliminates the need for the user to “guess” at the scattering properties of materials. Customers can also submit proprietary materials for measurement, ensuring the most accurate data possible for their analyses. To create an accurate material model we perform two types of measurements: integrated reflectance/transmittance, and material scattering. Both integrated reflectance, transmittance and absorptance, as well as material scattering are measured over a wide range of incidence angles at tight angular interval in order to ensure that precise data is available during the raytrace. Other material measurements may have data only every 15° and the data may stop at 75°. Our measurements are at least every 5°, and go all the way from nearly 0° up to 85° and beyond depending on the material. We'll measure the total integrated reflectance and transmittance in our integrating sphere. 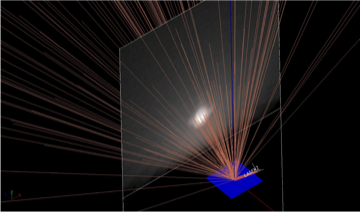 We'll measure the reflected and transmitted scatter in our custom developed BRDF/BTDF goniophotometer. We'll create Photopia Library files for your material and distribute to our users. Do you have custom lamps or materials for individual OEMs? Perhaps materials only used within your company, or custom LEDs setup with a certain die or phosphor configuration. We can make a model for these and just provide them to you or a specific client, not our general public library. You may have lamps or materials that are under development or only in engineering sampling. We can measure these products and add them to a private library, providing access only to people within your company or selected customers. Once you have a general release we can provide the product to everyone. Because this requires a little more management on our end, there is a small fee, but this allows you to get Photopia models for product under development into the hands of optical engineers that will be specifying your product in their projects. We trust the accuracy of Photopia everyday doing work for our optical design clients and we know that you will as well.